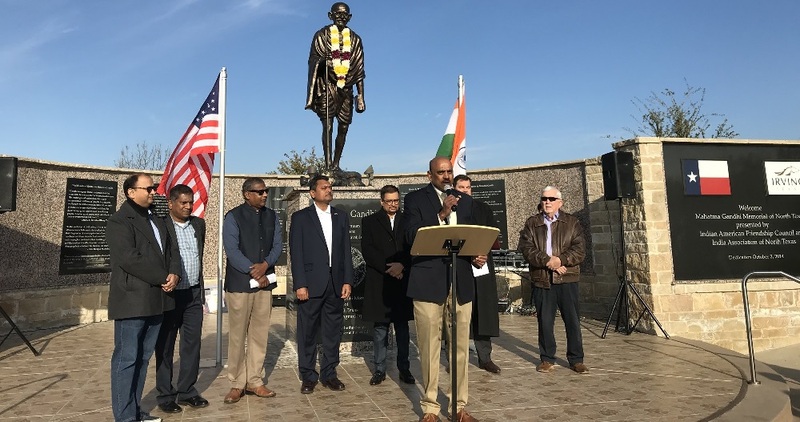 : Mahatma Gandhi Memorial of North Texas (MGMNT) organized the 70th India’s Republic Day Celebrations in Dallas (Irving) at Mahatma Gandhi Memorial Plaza, the Largest Gandhi Memorial in the USA. More than 150 jubilant crowd gathered to celebrate the event. Mr. Rao Kalvala, Secretary, MGMNT welcomed the gathering, introduced MGMNT Board and expressed his joy over public enthusiasm. Mr. B.N.Rao, MGMNT Co-Chair, conveyed his Republic Day greetings to the community and remembered the sacrifices of Mahatma Gandhi who got independence to India with only peace methods. The Chief Guest at the event Mrs. Oscar Ward, Deputy Mayor Pro Tem, City of Irving, welcomed Indian American community on this special occasion and appreciated their efforts in building better communities with their education, intellect and knowledge. Irving City Councilmember Mr. Allan Meagher, Special Guest of the occasion addressed the gathering, conveyed his best wishes to the Indian Americans for celebrating India’s 70th Republic Day. He further stated that it is essential for all to work together to uphold the democratic values both in the largest democracy, India and the oldest democracy, USA. Mr. Abhijit Railkar, Treasurer, MGMNT, in his closing remarks thanked ‘Music Masti Magic’ for providing Audio Visual, Bombay Photography, TV5, TV9 and TV Asia for media coverage, volunteers from Haryana Association, City of Irving officials, leaders from IAFC, IANT, and the community at large for joining and making the event a grand success. He invited the community again to gather at the same place on January 30th at 5 PM to observe a moment of silence and pay tribute to Mahatma Gandhi on the day of remembrance.